Dream Pod 9: Final 24 Hours of the Heavy Gear Blitz Utopia Armed Forces Plastic Miniatures Kickstarter! The Heavy Gear Blitz Utopia Armed Forces Plastic Miniatures Kickstarter to fund the plastic injection mold needed to make new plastic minis is now in its final 24 Hours of the campaign, ending Saturday evening February 3rd 2018 at 7:02 pm EST. The total pledged so far is $22,739 CAD (75%) of its $30K CAD (23K USD) initial funding goal. We need $7,261 CAD more in pledges or 104 Backer at our $70 CAD ($53.85 USD) Captain Reward Level pledge to make it a success. The Captain Reward Level includes an amazing 36 plastic Utopia miniatures plus Utopia Patch & Heavy Gear Blitz Rulebook PDFs (see image below). Or just 27 Backers at our Hero of Utopia Reward Level for a $270 CAD pledge. Treat yourself one of our great reward levels and maybe a few Add-Ons (see images below) like a Cute Chibi N-KIDU Drone resin model for an extra pledge of $22 CAD, click the link below to show your support and get into a New Game for the New Year! 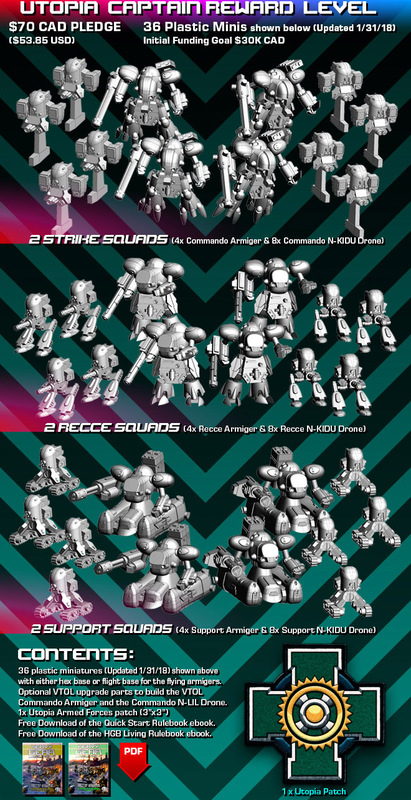 Home › Blogs › Robert Dubois's blog › Final 24 Hours of the Heavy Gear Blitz Utopia Armed Forces Plastic Miniatures Kickstarter!